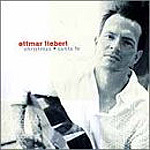 CD review: "Christmas & Santa Fe"
New age guitarist Ottmar Liebert turns in a surprisingly traditional set  though might not guess it by glancing at the song titles on the CD cover. "Santa Dancing"? "The 3rd Man"? But these are simply old songs with new names. "Silent Night" is now "Snow White"; "Winter Wonderland is reborn as "Dig the Wonderland. While the melodies remain instantly recognizable and straight-forward, everything does get a nice Southwestern turn to it, though. There is a certain Latin back beat to most of the arrangements, and Liebert works in Spanish and Mexican accents on his guitar. It can be startling at first  kind of like finding a jalapeño in your eggnog  but if you give it a chance, it works. Liebert's playing is soothing the way Perry Como's voice is soothing, and his reading of these favorites is warm, comforting and full of the holiday spirit.